Abdulaziz Sachedina hosted a rogues gallery of dubious academics with extremist views. "I am simply a Muslim . 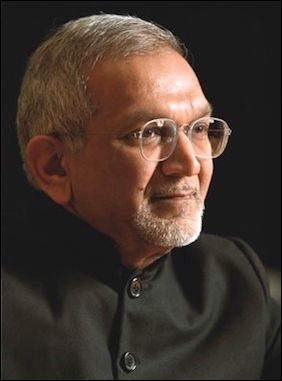 . . one who submits to God," neither Sunni nor Shiite, stated Abdulaziz Sachedina, the International Institute of Islamic Thought (IIIT) Chair in Islamic Studies at George Mason University, at a recent IIIT panel. Nonetheless, "The Need for Intra-Muslim Dialogue," which took place before about thirty-five in the conference room of IIIT headquarters in Virginia following evening Muslim prayer, indicated why Islamic ecumenism remains largely a pious hope. The Muslim Brotherhood (MB)-linked IIIT is a promoter of the MB's propagandistic "Islamization of knowledge" movement and the widely-used "Islamophobia" canard, with disturbingly deep connections to the field of Middle East studies. Additionally, IIIT has endorsed an English translation of the brutal, yet authoritative fourteenth-century sharia manual Reliance of the Traveler, while maintaining disturbingly deep connections to the field of Middle East studies. Accordingly, panelists included Imam Abolfazl Bahram Nahidian, a radical Shiite supporter of Iran's Islamic Republic and an anti-Israel 9/11 conspiracy theorist, and Mohamed Magid, former president of the MB-front group the Islamic Society of North America. Also present were IIIT officers Abubaker Al Shingieti, a former high ranking official in Sudan's genocidal Islamic Republic, the MB supporter Jamal Barzinji, and Barzinji's like-minded high school friend from Iraq, Hisham Altalib. Amidst such dubious characters appeared IIIT research director Ermin Sinanović. With no evident official concern, Sinanović teaches Middle Eastern politics to America's future warriors as an assistant professor of political science at the United States Naval Academy. He opened the panel by stating that current Shiite-Sunni conflicts "urge us to think deeply" about "long overdue" intra-Muslim dialogue. Even more important is a "Quranic imperative" forbidding "enmity among Muslims," Sinanović argued, quoting Quran 3:102-103. He urged participants in this "academic forum" to "keep it open, yet civil; respectful, and yet critical." IIIT is a promoter of the Muslim Brotherhood's propagandistic "Islamization of knowledge" movement. Sachedina, who is of mixed Shiite-Sunni parentage, repeated his previous support for sectarian tolerance, declaring that "we are not here to do the takfir," or apostasy pronouncement, "to decide who is right, who is wrong." He described how doctrinally divergent Shiites and Sunnis "believe in certain things" taught to "children in the Sunday schools." Yet, he added, there was "no way of stating categorically what happened in the early days of Islam" to validate these beliefs. The Quran records how Islam's "early community was . . . on the verge of breaking down completely," Sachedina continued. To learn about early Islam's sectarian divisions, he noted, "you just have to open Tabari," a tenth-century Muslim historian. In his twenty-three years as Islam's claimed prophet, Muhammad could not "transform" an Arab "tribal culture into a united spiritual, moral culture." Sachedina admitted that mosques in the U.S. often consign "non-kosher" people from the opposing sect to "some kind of isolation." Similarly, he added, many mosques "never ask a Christian priest to come and talk to us" because Muslims "are afraid" Christians "will corrupt what we believe." "We have locked up ourselves into a small cocoon of our own self-righteous attitude," he concluded, exhibiting rare self-reflection within Islam. Sachedina explained that a Shiite-Sunni "division of even knowledge" often excludes Shiite works from libraries in Sunni-majority Arab countries, even as Iranian libraries include Sunni writings because of a Shiite desire to expressly refute the texts of Islam's Sunni majority. Mirroring Iranian condemnation of Sunnis, Saudi clerics condemn Shiites as "heretics" who "don't follow the Sunna at all," while Jordanian professors with whom Sachedina spoke during the Iran-Iraq war referred to Shiites as kuffar, or infidel. An Iraqi Sunni questioner confirmed that, in her experience, the "Arab Sunna are very arrogant," both in terms of Shiites and nonconforming Sunnis. Referring to a Shiite-Sunni "history of constant struggle," Sachedina elaborated on the gruesome details: "If the walls around Teheran . . . would speak," they would tell of "thousands of Shias interred alive." Strangely, he then claimed that Islam calls for "restorative justice," not harsh sectarian penalties, to invoke Muslim reconciliation. Employing an analogy in which he accused Jews of "using the Holocaust to go on demanding this and that," did little to demonstrate his stated commitment to moving beyond the past. The panelists' discussion of historical Shiite-Sunni hostility should give pause to ubiquitous protestations of Islam's pacific nature. "Dialogue cannot only occur with the niceties," Sachedina continued, noting that among the "sore points" for Sunnis is the Shiite use of taqiyya, or Quran-sanctioned deception, a "survival strategy" for a "minority . . . under very adverse conditions." Shiites also engage in the "wrong practice" of cursing Muhammad's companions, or sahabah, who opposed the Shiites, but, he concluded, doctrinal disagreement should not entail that Muslims "throw mud." An audience questioner concurred that the sahabah are "very crucial for the Sunni." Responding to Sachedina, Magid, a Sunni, expressed his support for "honest dialogue." He remarked upon "extremists in both Shia and Sunni" who label each other's blood "halal," thereby justifying their murders as infidels on YouTube. Studying past Sunni-Shia scholastic interaction can "neutralize the issue of history," he concluded. Sachedina asserted that the situation in the U.S. presents a "unique opportunity" for Muslim dialogue, given the distance from the Middle East's "big havoc." American Muslims, Barzinji agreed, "can be the role model for the Muslim ummah." Sinanović, meanwhile, invoked Muhammad as the "best example" of human behavior (per Quran 33:21), and Muhammad's conquest of Mecca as the "most beautiful example of humility," two hagiographic assertions that ignore Muhammad's brutal biography. The panelists' discussion of historical Shiite-Sunni hostility should give pause to ubiquitous protestations of Islam's pacific nature. As Israeli diplomat Yoram Ettinger has noted, if Muslims cannot find peace among themselves, how will they find peace with non-Muslims? Devout Muslims fighting each other over questions of faith while fanatically rejecting doubt and debate can still turn their fervor towards outsiders. IIIT's unmerited respectability in academia and elsewhere indicates just how broad and deep such dangerous currents can run. Islam's unbelievers should beware.